"BBC approves new Doctor Who audio plays. Big Finish Productions, the company behind the recent audio dramatisations of the Bernice Summerfield New Adventures novels, has secured a ground-breaking licence to produce all-new, full-length Doctor Who audio dramas." This was the announcement in issue 275 of The Doctor Who Magazine in February 1999. Since then over 20 brand new Doctor Who audio adventures have been released with many more stories planned for well into 2002. We have had 4 incarnations of The Doctor, 10 companions including 2 new ones and the return of Bernice Summerfield and Frobisher. We have been terrorised by the return of the Ice Warriors, The Cybermen and the dreaded Daleks. But how did it all start and why in 1999 and not 10 years earlier when Doctor Who left our television screens? Big Finish Productions were formed in 1996 by Jason Haigh-Ellery and Nancy Hine as a small production company, handling both audio and video productions. Gary Russell (a previous editor of Doctor Who Magazine) and Nicholas Briggs (who is more well known for his involvement with the Myth Makers interview tapes and Reeltime Pictures) approached Big Finish Productions to do some audio science-fiction. Both had already worked together and were responsible for much of the output in Audio Visuals, a fan group from the late eighties who made unlicensed Doctor Who audio plays. They managed to secure a licence from Virgin Publishing to make audio dramas based upon their range of novels featuring one-time Doctor Who companion Professor Bernice Summerfield. They issued five audio dramatisations too much acclaim before being approached by BBC Worldwide in 1999. Big Finish Productions had already approached the BBC three years earlier regarding the idea of doing fresh, original Doctor Who audio dramas. At that time though everything was in a state of flux due to "Doctor Who: The Movie", starring Paul McGann, and the BBC were understandably reluctant to issue any licences of this nature. The securing of the licence to do Virgin's New Adventures output was partly out of a desire to prove science fiction could be done on audio, but also to show the BBC that they were serious and a professional company. Subsequently the BBC listened to what they had done and the licence was offered and eagerly accepted by Big Finish Productions. To ensure that the plays remain faithful to the Doctor Who television series in terms of style and content, BBC World-wide has retained the rights to approve all story-lines and scripts. Initially BBC Books range editor Steve Cole was the Executive Producer on BBC Worldwide's behalf. However, after Steve's departure from the BBC, that role was taken on by his former assistant, now Eighth Doctor desk editor herself, Jacqueline Rayner. Over the weekend of 6th and 7th March 1999, Peter Davison, Colin Baker and Sylvester McCoy led the cast in the recording of "The Sirens of Time", the first in this new series. The stars seemed delighted to be back in the harness in their roles as The Doctor and despite their high-spirited japes, writer/director Nicholas Briggs managed to call 'cut' at 7.00pm on the Sunday - bang on schedule. 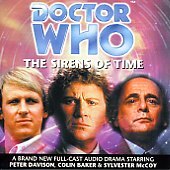 Released in July 1999 "The Sirens of Time" features brand new music and sound effects along with the traditional sound effects from the television series including the familiar TARDIS noises and the theme tune, originally composed by Ron Grainer. During this time Big Finish also confirmed its next produc-tions. "Phantasmagoria" staring Peter Davison in August 1999 and "The Sirens of Time" starring Colin Baker in October. Each of The Doctors were joined by a television companion - Mark Strikson, as Turlough and Nicola Bryant, as Peri respectively. Then at the end of Big Finish's first year it was announced that the releases would be going monthly. It was also announced that the Daleks would be returning not in one story but in three! The first of these was "The Genocide Machine" released in April 2000. As the year progressed further television companions and monsters, as well as some new ones, made their Big Finish debut's. "The Land of the Dead", released January 2000, saw Sarah Sutton reprising her role as Nyssa. 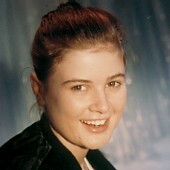 Sophie Aldred, as Ace, starred in "The Fearmonger" in February. Then in March the Sixth Doctor was joined, in "The Marian Conspiracy", by a brand new companion, Doctor Evelyn Smythe, played by Maggie Stables. The release in May 2000 was a Fifth Doctor story titled "Red Dawn" which herald the return of the Ice Warriors who last made an appearance in the Third Doctor television story "The Monsters of Peladon" in 1974. Then in June Brigadier Alistair Gordon Lethbridge-Stewart joined the Sixth Doctor with his 'new' companion Evelyn Smythe in "The Spectre of Lanyon Moor". July 2000's release, "Winter for the Adept", is another Fifth Doctor story with Nyssa played by Sarah Sutton. Also starring in this story is India Fisher who will be returning to play the Eighth Doctor's 'new' companion early in 2001. Lalla Ward's debut was in August 2000's "The Apocalypse Element" where she reprised her role as Romana. "The Fires of Vulcan", released in September, herald after an absence of 14 years in the show Bonnie Langford in the role of Melanie Bush. Then in October 2000 New Adventures companion and archaeologist Bernice Summerfield returned to the Doctor Who range since the end of the Virgin Books 'The New Adventures' stories. "The Shadow of the Scourge" is another Seventh Doctor and Ace story staring regulars Sylvester McCoy and Sophie Aldred as well as Lisa Bowerman as Benny. The release in November 2000 was another special story. Titled "The Holy Terror" it featured, alongside Colin Baker, the debut of Frobisher - the shape-changing Whifferdill who featured mainly as a penguin in The Doctor Who Magazine comic strips and in the BBC novel "Mission: Impractical". To round off the year was "The Mutant Phase" the third and final Dalek story for the year. Special Guest stars have also added their contributions to these stories - Jacqueline Pearce (who played Servalan in Blake's Seven and Chessene in "The Two Doctors") stars in "The Fearmonger". James Bolam (best known for his role in The Likely Lads, and When the Boat Comes In) and Toby Longworth (who was the voice of Trade Federation representative Lott Dod in Star Wars Episode 1 - The Phantom Menace) are both in "The Spectre of Lanyon Moor". Sally Faulkner (who portrayed Isobel Watkins in the classic Patrick Troughton story "The Invasion") stars in July 2000's story "Winter for the Adept". In the later half of 2000 even more guest stars added their contributions: Gemma Bissix (who played Nigel Bates' adopted daughter Claire in Eastenders) is in "The Fires of Vulcan". Sam Kelly (who is best known for his role as Bunny Warren in the sit-com Porridge, Captain Hans Geering in Allo Allo, and as a chauffeur in On the Up), Roberta Taylor (who played the part of Irene in Eastenders) and Peter Guinness (who was a regular in both Spender and Casualty and who was also in the film Alien 3) all star in "The Holy Terror". "Doctor Who has a fine tradition of employing great actors to be in the series, and, budgetary considerations allowing, we think it's great if we can continue that. We have a list as long as my arms (legs as well) of people we'd kill to work with. But we don't believe in guest stars for the sake of it. Actors must be cast for what they bring to a part, not what they bring to publicity". As announced in September 2000 Big Finish Productions are delighted that their licence from the BBC has been renewed through to the end of 2002. It was also reported that the BBC are pleased with the quality of the productions so far and that they think that Big Finish Productions are doing a fantastic job. 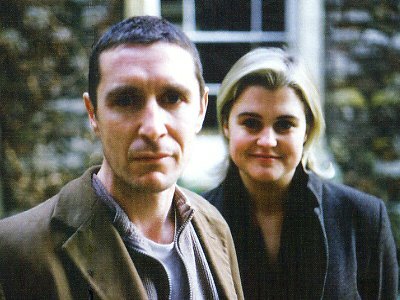 However, as announced earlier in the year, the beginning of 2001 was to herald something even better - The return of the Eighth Doctor, played by Paul McGann, along with a brand new companion Charley Pollard played by India Fisher. "Storm Warning", released in January 2001, was the first of four adventures for Paul and India. And the second story, February 2001's "Sword of Orion" saw the long awaited return of the Cybermen. Two more stories "The Stones of Venice", released in March 2001, and in April "Minuet in Hell", which also features the Brigadier, completed the Eighth Doctor's 'first audio season'. The Fifth Doctor, with Turlough, was the first of the 'previous' Doctor stories to be released in 2001 in May's "Loups-Garoux". June saw "Dust Breeding", a Seventh Doctor and Ace story followed, in July, by "Bloodtide" where the Sixth Doctor and Evelyn Smythe meet a young Charles Darwin and the Silurians. The Sixth Doctor and Evelyn returned in the following month's release called "Project: Twilight". And September's release, "The Eye of the Scorpion", had the Fifth Doctor and Peri in a pseudo-historical romp through ancient Egypt. While in October "Colditz" has the Seventh Doctor and Ace trapped within the notorious Second World War prison. November's release had the Fifth Doctor and Nyssa in "Primeval" and the end of 2001 was rounded off with "The One Doctor", which saw the first release of the first Sixth Doctor story with companion Melanie. If that was not enough for you then a special mini-series of four Doctorless Dalek stories written and directed by Nicholas Briggs were released during the year. Titled "The Dalek Empire" Big Finish Productions wanted these stories to evoke some of the spirit of the fondly remembered Dalek annuals and strips of the Sixties and Seventies. All four stories were closely linked with many of the same characters appearing in each story. As they were released one by one the tension was built up to a climax at the end of part four gave no doubt to the fact that this mini series was a huge success, even without The Doctor, and that the Daleks would be returning. 2001 was also not short of guest stars: Gareth Thomas (who played the intergalactic freedom fighter Roj Blake in Blake's Seven) stars in "Storm Warning" and in the four "Dalek Empire" stories. Michael Sheard, who appears in March 2001's "The Stones of Venice", is more famous for his role as a teacher in the BBC children's school drama programme Grange Hill. He has also appeared in many Doctor Who television stories and his film credits include The Empire Strikes Back and two of the Indiana Jones films. Burt Kwouk, who was Inspector Clouseau's martial-arts manservant Cato in the "Pink Panther" movies, appears in "Loups-Garoux". His other film and television credits also include: Empire of the Sun, Goldfinger, The Saint and The Avengers. 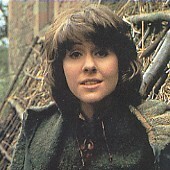 June's "Dust Breeding" stars Caroline John, who played companion and scientist Liz Shaw alongside the Third Doctor. To round off the year "The One Doctor" has a host of guests stars which is headed by entertainer and panto veteran Christopher Biggins who is a very famous face on British television for many years. The programmes he has been involved in include I Claudius, Rentaghost and Absolutely Fabulous. Joining Christopher are 2 Point 4 Children and Grange Hill star Clare Buckfield, Shooting Stars comedian Matt Lucas and Adam Buxton, who is one half of the team behind Channel 4's critically acclaimed The Adam and Joe Show. Like the previous year, the beginning of 2002 was to herald something even better than the beginning of 2001- The second 'audio' season for the Eighth Doctor, played by Paul McGann. This time though Big Finish Productions announced that they have done six episodes. It was also announced that not only would the Eighth Doctor at last get to meet the dreaded Daleks in "The Time of the Daleks" but at the end of the sixth story, "Neverland", not only ends this run of adventures, for the Eighth Doctor, on an explosive high but also that nothing will ever be the same again! 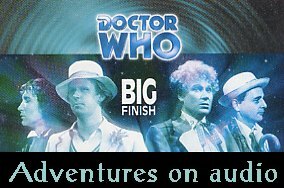 Due to the large period while all six Eighth Doctor stories were released before a 'previous' Doctor story would be released in July Big Finish decided to release another mini series of adventures starring the Fifth, Sixth and Seventh Doctors. Titled "Excelis Dawns", "Excelis Rising" and "Excelis Decays" these three separate stories will all take place on the same planet but during different time zones which are all connected by not only the visit of a different incarnation of The Doctor but by a holy relic that each Doctor must locate. And as to 2003? As well as the return of the Daleks in "Dalek Empire 2 - Dalek War" Big Finish Productions released the weirdest story so far with "Flip-Flop" which, according to Big Finish, you can listen to this two-CD adventure in either order. We also had a musical in Doctor Who and the Pirates where the Sixth Doctor gets to sing. The biggest event though for 2003 is the 40th anniversary celebration of the television show. As a precursor to the November 2003 anniversary adventure, " Zagreus", Big Finish Productions released three stories where three Doctor's faced three old foes (Omega, Davros and the Master), but in unusual circumstances. With all these exciting releases to look forward to and with more innovative stories being planned the future of the Big Finish Productions Doctor Who audio adventures has never looked so good. Long may Big Finish Productions continue.